The Shower Smoothie Recipe! | Watts Up Karin? I don’t know if the searcher was looking for Craig Alexander’s recipe, here (scroll down), or what, but I have a different favorite. It’s the deliciousness that’s pictured with my blue toes in a post-long-run ice bath. Caution: the shower smoothie is prepared in the kitchen, but shower smoothie time is spent in the bathroom. If you have a problem mixing food with fixtures, this is not the recipe or recovery method for you. Home-froze bananas, plus various bags of yumminess from the frozen foods section. Frozen bananas are kinda clutch, in my opinion. They make your shower smoothie frothy and filling. I peel and freeze smoothie bananas once cereal bananas become too ripe for my taste. My freezer looks like a banana morgue. 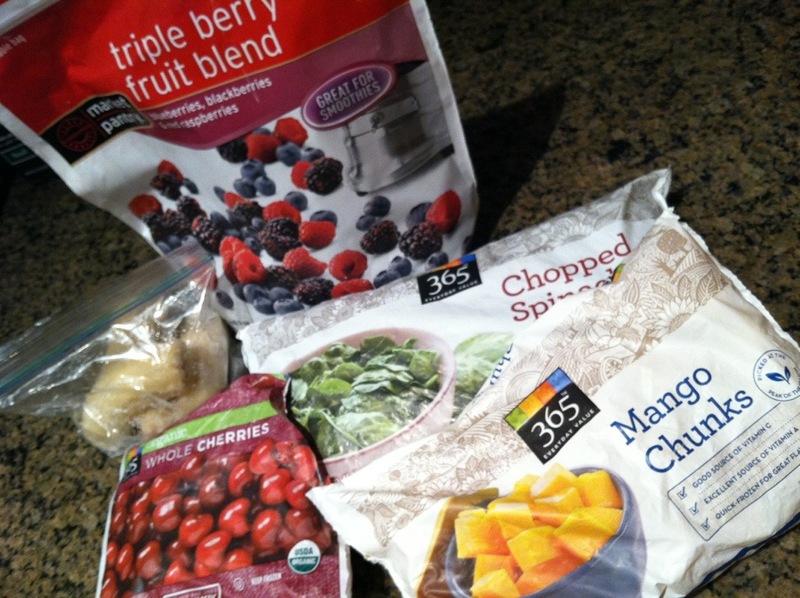 Choose your own “flavor fruit”: mixed berries, blueberries, mangos, cherries, even spinach (yes, I KNOW spinach isn’t a fruit). 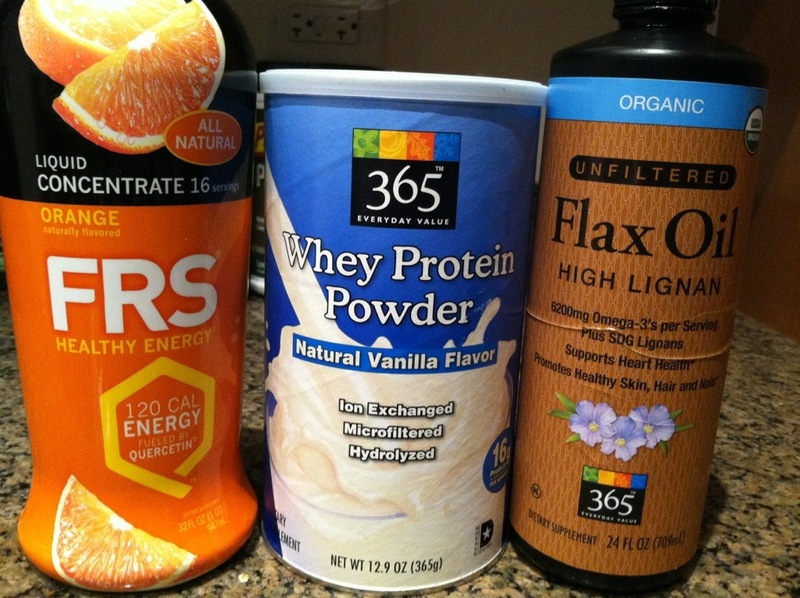 Take into account what kind of supplements you may be adding; don’t mix spinach with vanilla protein powder. 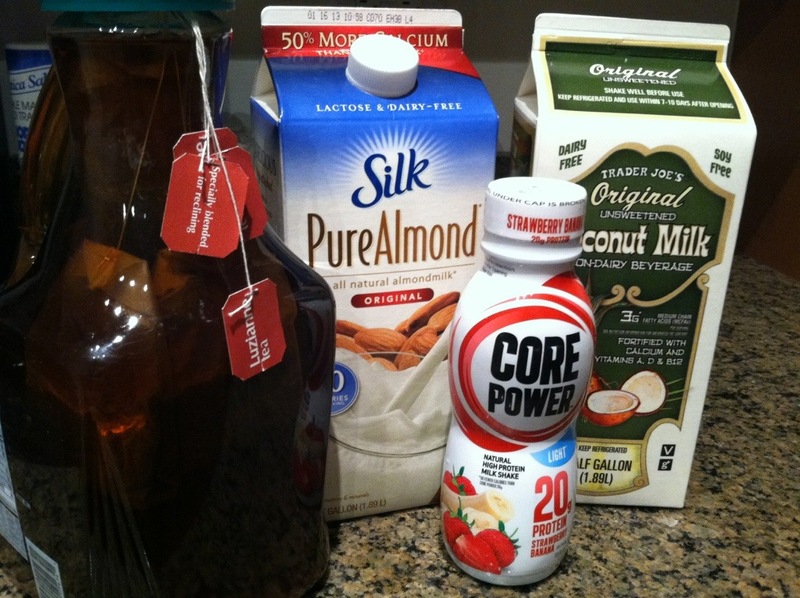 Liquids I have on hand: iced tea, almond milk, Core Power (Craig Alexander just blends two of these with a banana, the lazy bum) and coconut milk. Coconut water and any kind of fruit juice are also good. I always have almond milk on hand, but you can use anything (except water. Blandzilla! ): orange juice, apple juice, coconut water, coconut milk, regular milk, even iced tea. Almond milk is my favorite. Apple juice is good for “savory” smoothies like Green Monster-style spinach ones, and tea is nice because it lends herbaceousness and is non-caloric. I wouldn’t use tea with protein, though I’ve never tried it. On-hand add-ons: FRS for citrusy energy, vanilla protein for shower smoothie classic, and flax oil for Omega-3s (doesn’t taste like anything, but more tasty and vegan than fish oil). There’s plenty to choose from out there, but I like the vanilla flavored whey protein stuff from Whole Foods’ 365 line just fine. Adding protein makes a shower smoothie what it is –a recovery drink– and whey protein is faster absorbed than soy protein. I have this FRS concentrate stuff on hand if I just want a jolt in my breakfast fix. Two “specialty” items I include in a good shower smoothie are lecithin granules (not pictured; I’ve run out) and flaxseed oil. Add 1-2 tablespoons of each. The oil has all yer Omega-3s and whatnot, which are good for your muscles, and the lecithin is good for your brain and nervous system and junk. The lecithin also acts as an emulsifier, so your water-based fruits blend nicely with the oil. Pro tip: shake up your flaxseed oil and store it on its side in the feezer. There are solids in there –the hulls of the flaxseed which are high in fiber and good for you– and this helps squirt them out in even ratios with the oil. 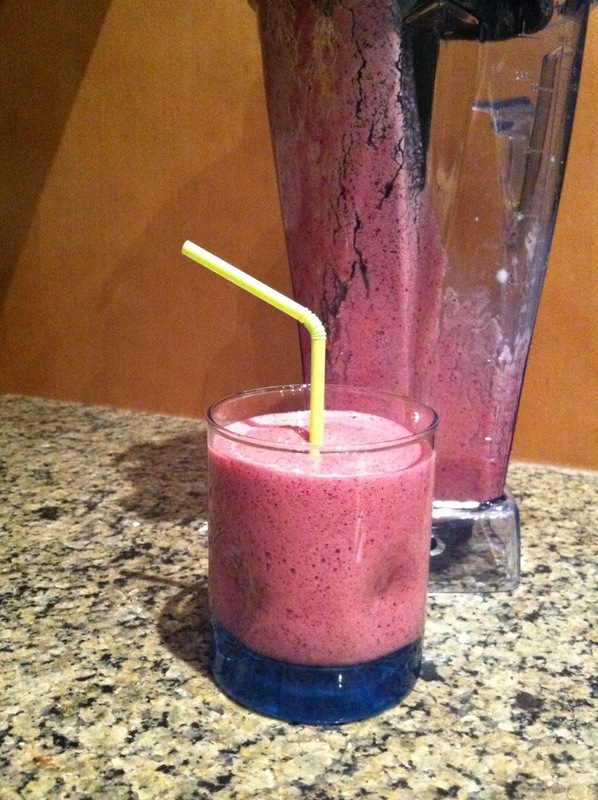 Chuck all your stuff in your blender, or in a stick blender-safe cup. 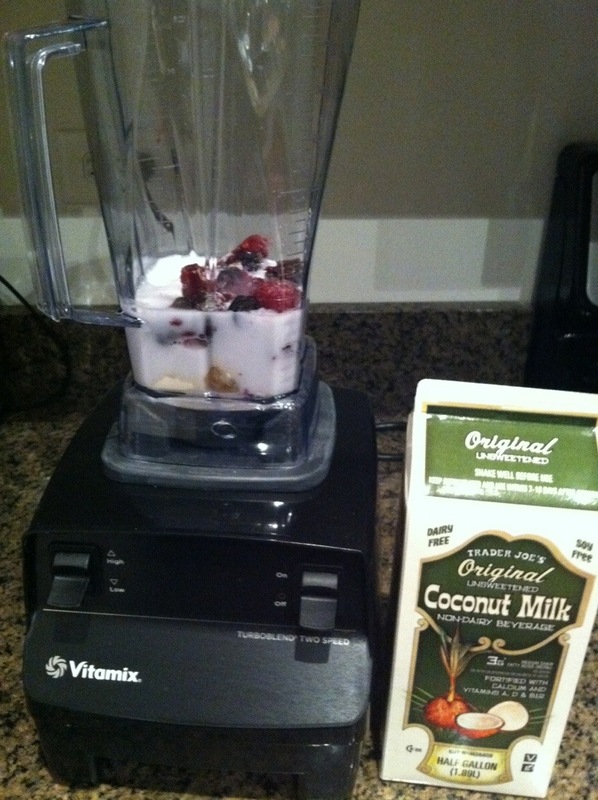 I ❤ this Vitamix. Throw it all in there. There’s no point in measuring everything, especially after a workout when you’re just concerned with cramming something into your stomach, getting clean, and going to bed. If you’re an obsessive food logger, God bless you. Let’s just say a whole banana plus ¾ to 1 cup fruit needs about 1½ cups of liquid (?). 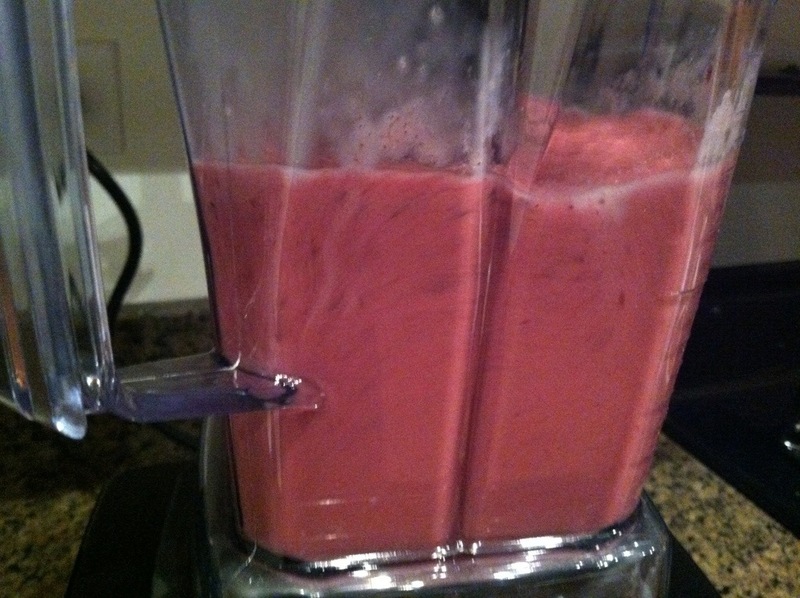 Banana + cherries + almond milk + vanilla protein (+lecithin + flax oil, optional) = amazeballs. HULK SMOOTHIE. If I had any on hand, I’d probably add some fresh mint to this one next time: even with the mangoes, the tea made this one taste a little too much like blended salad. 1 full banana + 1 cup unfiltered apple juice + 2 tbsp each (Green Vibrance, lecithin, flax oil). Pingback: Recovery: My Interview with Craig Alexander « Watts Up Karin? Since you have a Vitamix, you can do better than flax oil by just putting in whole flax seeds–that way you don’t have to worry about the oil going rancid, and you get a little extra fiber and protein; plus they’re generally cheaper. You might want to try chia seeds–they have a similar nutritional profile, but they have a more mild taste. Another thing I do is to add whole almonds instead of almond milk. I recommend giving it a try some time. Then you can expand to other nuts; macadamias are awesome, and I also like to use soaked walnuts. The Vitamix can handle them! =D Thank you, Joy (or JoB?). Yes, I have used Chia seeds in the past, but have an out-of-sight-out-of-mind problem while I’m low on “supplements.” Thanks for the reminder; chia makes for a fun texture. And thanks for the tips on the Flaxseeds and nuts!